Paul French is a widely-published journalist and commentator on China. Previous books include a history of foreign correspondents in China and a biography of the legendary Shanghai adman, journalist and adventurer Carl Crow. 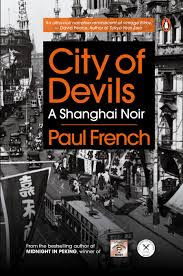 City of Devils is French’s much-anticipated second narrative non-fiction book, following Midnight in Peking which was a New York Times bestseller, and a BBC Radio 4 book of the week. City of Devils is set in Shanghai, 1941, where even the wildest dreams seem possible. It is a true story of two friends turned enemies. In a city under siege Viennese Joe Farren rose to fame by cashing in on Shanghai’s desperate pleasure seeking. King of the chorus lines, his name was splashed in neon across the infamous Badlands nightclub ‘Farren’s’. American fugitive Jack Riley, his fingertips acid-burnt, found a future in Shanghai as ‘The Slots King’. ‘Dapper Joe’ and ‘Lucky Jack’ collided, clashed and came together again in a frantic struggle to survive the city’s last days. Paul French resurrects the denizens of old Shanghai’s ganglands, the drug-running, the gambling, and the graft, vividly restoring this long-overlooked side of the city’s history. Here Paul explains how he came to focus on ‘Dapper Joe’ and ‘Lucky Jack’, in a book initially intended as a portrait of Shanghai. City of Devils: A Shanghai Noir was inspired by a city – the characters came later. After an obsession with Shanghai developed in childhood and many years spent living and working there spending all my free time trying to uncover it’s pre-1949 incarnation I wanted to write a story of the wild last days of city before it fell to Japanese occupation. It wouldn’t need characters – real or imagined – nor require any dialogue. Surely the syncopated rhythms of the dance halls, the fizz of the neon lights, ship’s horn on the river, competing traffic would be enough? It seemed obvious to me. It would simply be an urban portrait, the city as a living, breathing organism with the blood of modernity running through its veins. Shanghai: the tender lover and nurturer of hopes and dreams. Shanghai: the cruel mistress and harsh judge in a city where most are still, and always have been, found wanting. What are mere people against such a force? But it’s impossible. It doesn’t work, it just ends up as sprawl, often incoherent, sometimes flat out boring, mostly highly confusing. A wise writer abandons the project before madness strikes. Perhaps you could achieve this aim with another medium – film most likely. Indeed, Russian filmmaker Dziga Vertov’s 1928 Man with a Camera is just such an attempt. Vertov attempts to capture the Soviet city in its entirety, its modernity, its density and layers. He does a pretty good job, though he ranges across Moscow, Odessa, Kiev and Kharkov rather than a single metropolis. It is a film consciously without a scenario (it’s a silent so no subtitles or intertitles) and no professional actors. Vertov himself was inspired by Walter Ruttmann’s Berlin: Symphony of a Metropolis (1927) that focuses on a day in the life of the German capital. China also has its filmic attempts to capture the immensity of urban life. The Shanghai Document (1928) was an attempt by a group of Soviet filmmakers, led by Yakov Bliokh, to capture the city, emphasising the vast inequalities between rich and poor; Chinese and Shanghailanders. Shanghai modernist writer Liu Na’ou tried something similar in Man with a Movie Camera (1933) filmed in Tainan, Guangzhou, Shenyang, and Tokyo. But even these films – devoid of actors, scripts and plots – ultimately anthropomorphise the city giving the metropolis human characteristics – waking up, having lunch, easing into the evening, enjoying the night. You look for recurring characters and try to trace their route through the urban 24 hours. Baum’s attempt to recreate Shanghai was ambitious and largely successful but not the only recreation of a Chinese city. Lao She gave us in-depth and critical descriptions of his home town Beijing just prior to the Japanese invasion in Rickshaw Boy (1936), though his beleaguered rickshaw puller Camel Xiangzi stays in the mind as much as the city streets he pounds day-in, day-out. Japanese new sensualist writer Yokomitsu Riichi wrote his novel Shanghai in 1931, which dwells on the waterfront of the port city, the Little Tokyo district and the cotton mills and silk filatures. Andre Malraux sought to describe the events of Canton Uprising of 1925 in The Conquerors (1928) and then again, the 1927 failed Shanghai Uprising in Man’s Fate (1933). Of course, often books start the other way around. My previous literary non-fiction book Midnight in Peking (2013) was like that – a girl, a murder, a killing unsolved. Only while trying to unravel the case did I become obsessed with the dark hutongs, sinister legations and Badlands alleyways of 1930s Peking. But City of Devils was different. It began with Shanghai and then came a search for a story. I found it eventually in real life – the twin tales of Josef Pollak, a Jewish boy from Vienna who changed his name to Joe Farren and ran the biggest casino ever seen in Shanghai, and John Becker, a US Navy vet who escaped from the Oklahoma State Penitentiary to Shanghai, burnt off his fingerprints, changed his name to Jack Riley and became a criminal legend. Engrossing as I found these men, their women, friends and enemies they still remain ultimately tiny dots within the giant metropolis of Shanghai. Through them I seek to interpret and describe the city which, unlike them, has not now passed and turned to dust but remains in all its wonder, still growing, changing, expanding. Details: City of Devils is published in paperback by Penguin. Priced in local currencies.